If Apple wasn't saddled with iPhone 4 production constraints, launch sales could have gone as high as 2.5 million, one analyst believes. And if limited stock continues, it could open Apple up to a "competitive risk," according to a new analysis. iSuppli Corp. on Tuesday said that Apple's inability to meet demand for the iPhone 4 could be problematic for the company if issues continue. They said it could prompt "frustrated customers" to consider switching to a competing smartphone. "While the channel supply issue might not impact total iPhone sales for the entire year, what is happening now certainly has done some damage to the Apple brand," said Tina Teng, senior analyst for wireless communications at iSuppli. "Consumers, questioning Apple's supply chain management capability, have started to look for alternative devices. In particular, consumers are not satisfied with Apple's response to the antenna issue causing poor reception and dropped calls." iSuppli believes that 21.7 million of the 42.6 million iPhones Apple will sell this year will be its latest model, the iPhone 4. But the report said the huge demand for the new handset has come at a cost for Apple. As evidence of events that could drive away frustrated customers, the report cited technical issues that prevented some from preordering an iPhone 4 on the first day, and cause AT&T to suspend its orders entirely after 24 hours. Customers turned out in droves last week at Apple stores to be among the first to own the iPhone 4, and those lines grew again Tuesday as AT&T began accepting first-come, first-served orders at its retail locations. 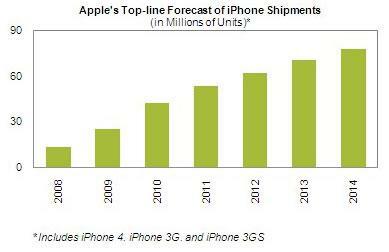 Strong demand has also forced Apple to advertise a three-week wait for new iPhone 4 orders. Teng said that manufacturers should learn from Apple that any product launch can come with a number of unexpected issues. "The lesson here is manufacturers beware," she said. Analyst Shaw Wu issued a note to investors Tuesday in which he said if it weren't for production constraints, he believes iPhone 4 shipments would have been between 2 million and 2.5 million. Apple announced on Monday that it sold 1.7 million of the iPhone 4 in its first three days. That soundly beat the previous records of 1 million held by the iPhone 3G and iPhone 3GS. Unlike iSuppli, Wu does not believe customers are very likely to choose an alternative smartphone due to supply issues. "At this point, we remain comfortable with our forecast looking for 9 million total iPhone units for the June quarter and 40 million for (calendar) 2010," Wu wrote. "The one risk we see is continued supply issues due to production constraints. We are not as concerned with demand generation nor competition." The analyst also spoke once again on the iPhone 4 antenna issue that continues to gain publicity. Last week, he said that the "worst case" for Apple would be that the Cupertino, Calif., company gives away free protective cases for the handset with little financial impact. On Tuesday, he reiterated that belief. "In terms of the antenna reception issue caused apparently by human contact with the external antennas, there has been speculation that a software fix could be in the works," he said. "If not, we again do not believe this is that big of a deal in that most users opt to have a case anyway to protect their iPhone and to customize to their personal preferences."